This year we’re using each day of the show to promote a different element of our platform. We’ll be sharing content on Twitter and LinkedIn too, so make sure you follow us to get all the latest updates. Two days down and my colleague tells me we’re now exactly 54.8% of the way through the show. Being at an event full of engineers I shouldn’t be surprised that someone’s actually developed an app for that. Despite tired legs and croaking voice, there’s a buzz about NAB that makes me look forward to day three. The speed with which conversations on concepts turn into new technologies means a show like NAB is always interesting. Our main theme for tomorrow is SSAI support for MPEG-DASH and CMAF – two areas that have developed significantly in the last twelve months. There’s been a lot of talk in the industry about MPEG-DASH. 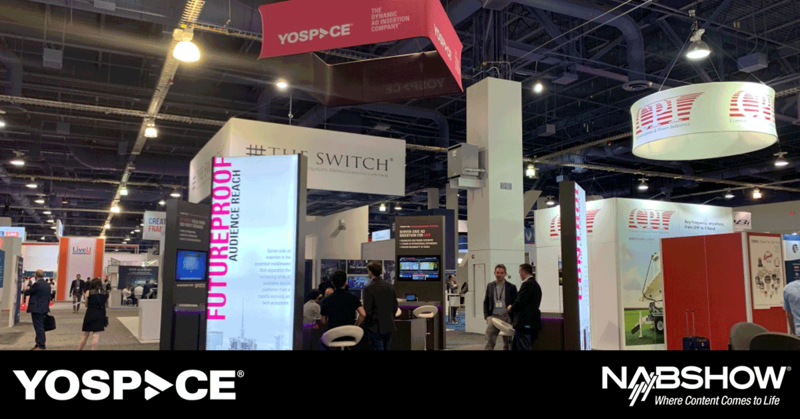 Yospace was the first vendor to announce server-side ad insertion (SSAI) support for MPEG-DASH and isone of the only vendors today that has live customer services using it, so we’re in a strong position to talk from a point of experience. The ecosystem for supporting MPEG-DASH is still relatively immature in terms of players, encoders and packagers. Behind this is the fact that the specification for MPEG-DASH doesn’t specify exactly how an MPD should be expressed to support SSAI. Read the thoughts of our Founder & CTO in this blog post. At 3.30pm our Founder & CTO David Springall will be presenting on the Bitmovin booth. He’ll be discussing our integration points as well as server-side ad insertion for CMAF. There’ll be an accompanying blog post – so check our Twitter and LinkedIn profiles to access it. Have a great day 3 of NAB. Click here to book a meeting or pop by SU3414 – it will be good to see you.